At Eagle Animal Hospital and Pet Resort in Riverside, our veterinarians and medical staff recommend annual pet wellness examinations for the same reason your personal physician or dentist recommends them—if a health problem or issue can be detected in its early stages, there is a far greater likelihood it can be resolved and treated with less difficulty, less expense, and greater success. A comprehensive physical examination helps your veterinarian evaluate your pet’s health and make informed decisions about your special companion’s veterinary care. In addition to a complete physical for your pet, the exam is also an opportunity for you to discuss any concerns about your pet’s health or behavior with your veterinarian. If you’ve observed any changes in your pet’s body weight, appetite, water intake, urination and bowel habits, and/or activity level, this is the time to mention them. Changes may be signs of medical problems. Seemingly insignificant lumps and bumps under the skin may be indications of infection or cancer. Common painful conditions, such as ear infections, abscessed teeth, or gum disease may not become noticeable until seriously advanced. Catching these conditions early will lead to a happier, healthier pet and ensure his or her greatest chance of living a long life. At Eagle Animal Hospital and Pet Resort, we provide customized and extended vaccine protocols to fit your pet’s unique needs. 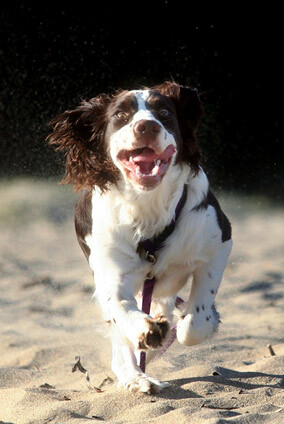 Protocols are tailored to suit your pet’s individual lifestyle, age, breed, and so on. We realize that as a pet ages, his or her needs change. Therefore, we focus on preventative pet healthcare through routine blood work, radiographs, and urinalysis to catch problems before clinical symptoms appear. We recommend certain core pet vaccinations for puppies and dogs, and kittens and cats. DAPP (Distemper, Adenovirus, Parainfluenza, and Parvovirus), Leptospirosis, Rabies, and Bordetella. FVRCP (Feline Rhinotracheitis, Calicivirus, Panleukopenia) and Rabies. We also recommend FeLV (Feline Leukemia). 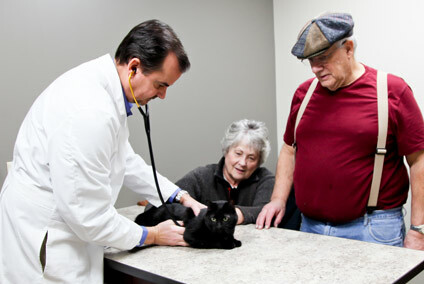 Thanks to advances in veterinary medicine, pets are living longer than ever. Senior animals make wonderful pets and companions; however, they have different medical needs from puppies and kittens. Pets age faster than people and are considered to be seniors around age seven, so once your pet has reached this age we recommend at least one physical examination per year, though more frequent pet exams are encouraged. During this examination, we’ll perform tests that can detect the signs of heart disease, infection, diabetes, and other health problems. The Gold Exam – Includes a complete blood count (CBC), T4 hypothyroidism test, a chemistry panel (which checks blood electrolyte and for diseases of the liver, kidneys, and pancreas), a urinalysis, radiograph, glaucoma screening/tonometry, and blood pressure check. The Silver Exam – Includes CBC, T4 test, chemistry panel, urinalysis, and a radiograph. The Bronze Exam – Includes CBC, T4 test, chemistry panel, and urinalysis. Like most pet owners, you probably enjoy spending quality time with your pets both indoors and out. Unintentionally, you may place them at risk for unwelcome visits from pesky parasites like fleas and ticks. Both external (fleas, ticks) and internal (heartworm, hookworm, roundworm) parasites can cause problems for your pet and your family. In Missouri, pets are at increased risk for tick-borne diseases and bacterial infections. Flea and tick prevention is the best approach to eliminating all of these pests. Please ask a staff member at Eagle Animal Hospital and Pet Resort for the best way to prevent flea and tick problems in your pet. We carry a wide range of prevention products that we will recommend based on your pet’s lifestyle and environment. Heartworm disease is a serious, life-threatening disease affecting dogs and, to a lesser extent, cats. It is a concern for pets throughout Missouri, as the disease is easily spread by infected mosquitoes. Clinical symptoms of heartworm disease develop very slowly. Lack of energy and exercise intolerance are early symptoms, as are coughing and difficulty breathing. Because heartworm disease is increasing in frequency and is a serious and deadly disease, we recommend an annual heartworm test for dogs. Heartworm disease prevention is simple and effective. For dogs, a once-a-month heartworm preventative can be given as a tasty, chewable treat. This same chewable medicine prevents not only heartworms from developing, but also kills and prevents most other types of worms that can infect your dog. Cats are protected by applying a drop of heartworm prevention liquid to their skin once-a-month. We recommend this to prevent heartworm disease as well as fleas, ear mites, and other types of worms that can infect your cat. If you would like to have your pet tested for heartworm disease, or if you would like additional information on how best to protect your pet from this dangerous parasite, please call Eagle Animal Hospital and Pet Resort today or reach us online for an appointment. We can discuss which product will best fit your pet’s needs. Leptospirosis is a disease that infects dogs, humans and other animals. The organism that causes the disease is a type of bacterium called spirochete. Leptospirosis is spread by recovered animals that shed the spirochete in their urine for months to years following infection. Exposure to the disease usually occurs in the environment from contaminated water, food, soil, or vegetation. The Leptospirosis organism penetrates through the interior lining of the mouth (mucosa) or through injured skin. Wild animals, especially rats, are carriers of the disease. Symptoms of Leptospirosis begin to appear about 1-2 weeks after exposure. Signs associated with the disease are fever, depression, vomiting and a reluctance to move. Loss of appetite, dehydration, and weight loss are also noticeable symptoms. This bacterial infection can cause severe life-threatening damage to the liver and kidneys even after treatment with antibiotics and supportive care. For puppies, a series of two boosters administered 3-4 weeks apart is required for full immunity. Yearly booster vaccines are required to keep immunity at a proper level. For more information about our pet wellness services or to schedule your pet’s next wellness appointment, please contact Eagle Animal Hospital and Pet Resort today at (816) 741–2345.